NVCS Ltd has a proven track record within the leisure and recreation industry, successfully supplying bespoke vending solutions to sports centres, swimming pools and leisure complexes in the East Anglian region. Those in the leisure industry know the importance of offering the complete guest experience and an important part of this experience is the provision of top quality refreshment services when and where visitors need them. NVCS Ltd understands that the leisure environment needs to offer healthier and nutritious products alongside popular brand leading snack and confectionery items. By offering vending selections such as nuts, dried fruit, cereal bars, low fat and low sugar drinks and snacks we are able to fulfil this important requirement. In addition we can tailor the selections to incorporate popular sports drinks and energy bars that are known best sellers in the leisure setting. Whether to complement existing catering and refreshment services, or to offer a stand-alone 24-hour drinks and snacks solution, NVCS have the answer. Most of our vending equipment incorporate a ‘guaranteed delivery system’. This system guarantees that the product is delivered to the customer or an automatic refund is given, thereby minimising refunds, which is important in busy public sites. Let your staff and visitors enjoy delicious hot and cold drinks, snacks and confectionery items at any time, day or night. Our experienced operators know exactly the type and variety of snack items to display in the machine to maximise returns and keep your customers satisfied. Our range of vending machines for the leisure and recreation industry are all easy to use and can offer alternative payment options. 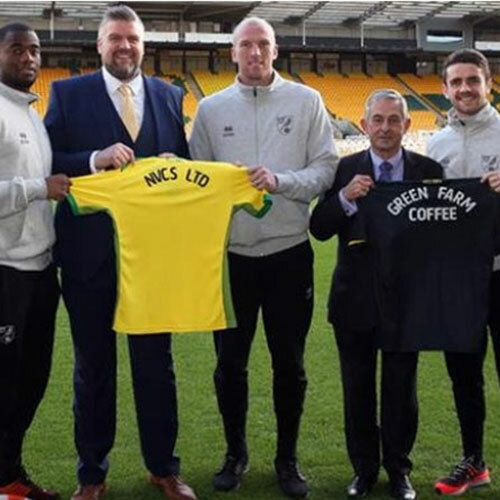 NVCS incorporates Green Farm Coffee – the official coffee partner of Norwich City Football Club.